I love waterfalls, and take pictures of them when I find them on my rides. Northeast of Bloomington, Bean Blossom creek flows north to northwest until it flows into the West Fork of the White River. One Sunday, Jojo and rode along Bottom Road. 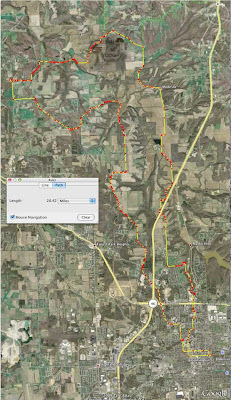 Its about five miles of “flat” riding up to the intersection of Woodall Road. Woodland Road heads west off of Woodall, and rises out of the valley, and which intersects Barr Road. We took that back east, and it dropped into the valley, where to our suprise we found a dry waterfall with a large pool. It was quite interesting how the water was totally contained by large rocks, even though it was dry uphill and downhill from the site. My camera had a finger smudge, so my pictures aren’t that great, but I posted them anyhow. Shirley Springs is a great place to visit in the summer. I stopped by on the way back to the Mother Hubbard’s Cupboard ride headquarters at Karst Farm Park on Saturday. 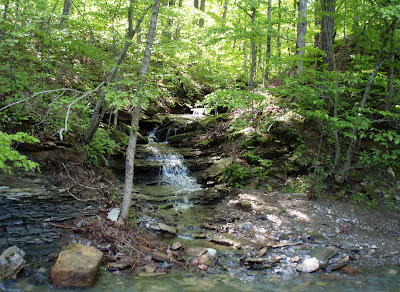 The Leonard Springs Nature Park is a couple of miles southwest of the square on Leonard Spring Road. It has 95 acres of woodland ridge and valley, and several springs. There is an iron walkway from the top of the ridge to the emergence of the Shirley Springs about half way down. The water was cold and refreshing on a 90 degree day, and with the recent rains, running at full force. This spring I found the small white Trillium grandiflorum all along the hillside. The valley used to be a lake (which supplied city water for a few years), and as a wide variety of vegetation. Waterfalls are special places, maybe it’s the ions, the water vapor, the sound, the whole experience is magical, waterfalls have a spirit, and each one is unique. This waterfall runs most of the year, and is visible from Mt. Gilead Rd. The small branch that falls into Stephan’s Creek runs for about a half mile till it attains the Mt. Gilead Ridge. There are not that many waterfalls in Monroe county, I hope on visiting them all this year, but I don’t know where they all are. Let me know of any you are aware of, I would love to take a shower in each and everyone this summer. 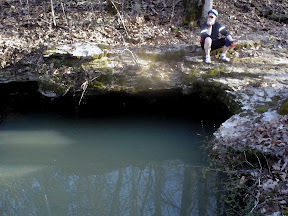 An easy ride to the southwest side of town, the Leonard Springs Nature Park is a great getaway, and Jojo and I biked out there last weekend. 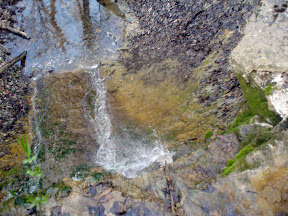 The water was flowing really well, the waterfall below the springs was loud and proud. I think this is the best waterfall in the county, anyone know of others I can visit?